If government officials choose FSI than why don't you? These course were developed, by experts over years, to be the most extensive and accessible on the market. Complete a Foreign Service Institute course and you will have perfect German pronunciation as well as solid reading skills and a vast vocabulary. You will understand everything spoken around you and be able to communicate with ease. Each level contains roughly six hours of audio material and a book for support. This is a two level course designed to give students a command of spoken German. It lays a solid foundation for comprehensive language skills, and provides systematically for the development of reading proficiency based on oral skills. The text is the end product of several years of work and has benefited from the labors of many members of the FSI staff. Level 1 covers Units 1-6 and comes with the equivalent of 12 CDs and text, and is a Digital Edition, featuring audio in MP3 format and text in PDF, available for download. Download of Foreign Service Method German Level 1 | $25 was $49)! German Level 2 | $25 (was $49)! German Level 3 | $25 (was $49)! This revolutionary product is dramatically altering how language-learning is approached. The allTalk course is a favorite with language learners because of its combination of effective and entertaining learning that helps you learn a language and enjoy it! Plus, with the allTalk Complete course you learn more and spend less. allTalk Complete is like three comprehensive all-audio courses together in one course. Learn 2000 words with the allTalk Complete course - much more vocabulary than any similarly priced course ... or as much as three levels of other comprehensive all-audio courses that cost many times more! Now download the allTalk Complete All-Audio Course in a digital MP3 version, and get it today - and save $125 over the CD version! This is the same version, but without the phrasebook, and is great for the on-the-go lifestyle; learn on your iPod, netbook, or cellphone, wherever you are! 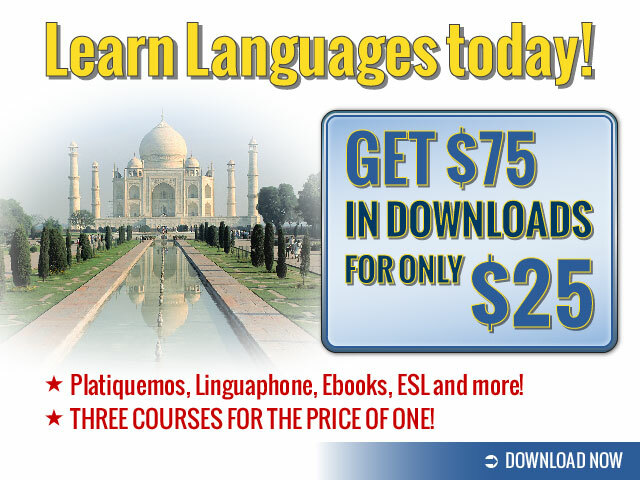 This is an amazingly efficient course that helps you quickly get on your feet with acquiring a new language. This course is great for students, travelers, and businesspeople. You will learn how to communicate in a variety of situations from common situations faced by travelers and businesspeople, to everyday conversations in which you discuss yourself, your family, and your life. The key is learning to converse. With Linguaphone's PDQ course, you aren't just taught words and phrases, but you're coached on how to actually converse using your new language. They are a perfect on-the-go alternative to acquiring a new language. You can learn in your car and then reinforce your knowledge with the workbook/learning guide. Then, once you have a basic understanding of the language, you can dramatically increase your communication abilities through the acquisition of hundreds of phrases in our comprehensive 250-page phrasebook. Now download the PDF Quick Acquisition Course in a digital MP3 version, and get it today - and save $20 over the CD version! This is the same version, but without the phrasebook, and is great for the on-the-go lifestyle; learn on your iPod, netbook, or cellphone, wherever you are! Power Translator Premium is an economical way to translate multiple languages - translate to and from English, French, German, Italian, Portuguese, Russian, and Spanish. Operates on Windows XP/Vista/Windows 7; 60-505 MB for single language; 410-1155 MB for multi-language versions. And now we are offering downloads of Power Translator - just purchase and we'll send you a link for the download! Power Translator Personal is LEC's most economical bilingual desktop software. It meets the needs of individuals to communicate with family and friends. Great for students. Power Translator Personal comes in versions for specific language pairs: French<>English, French<>German, German<>English, Italian<>English, Italian<>German, Portuguese<>English, or Spanish<>English. Operates on Windows XP/Vista/Windows 7; 60-505 MB for single language; 410-1155 MB for multi-language versions. And now we are offering downloads of Power Translator - just purchase and we'll send you a link for the download! Power Translator Pro helps grow businesses by providing more access to technical subjects and business documents. It is the most advanced version of LEC's economical bilingual desktop software. Pro versions provide bidirectional translation between English and one other language (either Spanish, Portuguese, French, German, or Italian). Operates on Windows XP/Vista/Windows 7; 60-505 MB for single language; 410-1155 MB for multi-language versions. And now we are offering downloads of Power Translator - just purchase and we'll send you a link for the download!